Iain Farrington: Fast Dance from Fiesta! 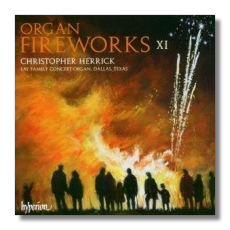 Hyperion's global tour of pyrotechnic organ works continues unstintingly with this 11th volume of some truly spectacular pieces by a host of wonderful composers, some of which are truly off the beaten track. The programme includes such celebrities as Copland, Janáček, Guilmant, Langlais and Widor but the other nine lesser known names are certainly deserving to be included with this elite group. Lemare, Behnke, German, Nagel, Gigout, Tackle, Farrington, Kiefer and Jongen all contribute to this exhilarating programme of some inspiring classical pieces interspersed with an entertaining selection of jazz-infused works. The highlight of the disc is without doubt Joseph Jongen's 'Sonata Eroica', a landmark 16-minute composition which appeared in 1930 and took Europe by storm. Modelled on Liszt's Sonata in B minor, this unique single span of heroic organ writing is still considered to be one of the 20th century's masterpieces of its genre. Christopher Herrick is his usual inimitable self, combing a sense of fun with a spontaneous grandeur which is at times, totally arresting. The listener is also regaled with the impressive sound of the Lay Family Organ in Dallas, Texas, a 4535-pipe monster. Volume XII please?